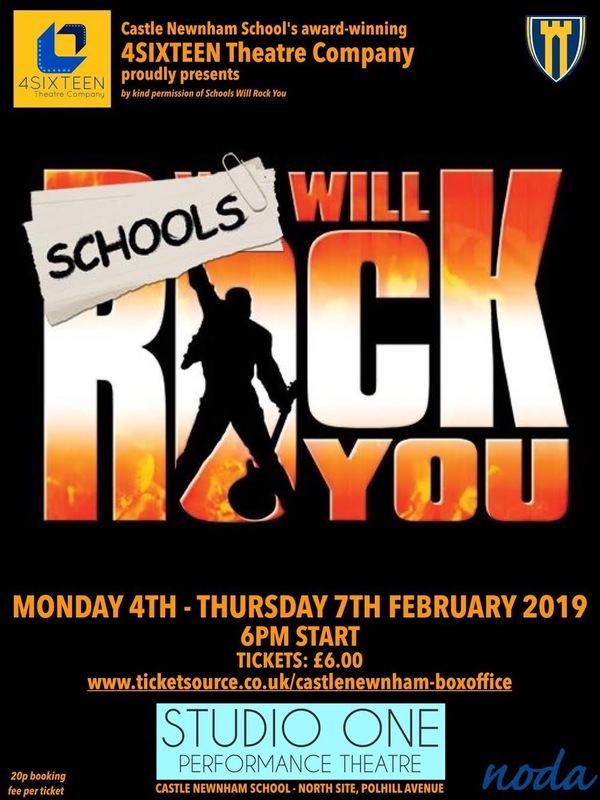 Castle Newnham School's award winning 4SIXTEEN Theatre Company are proud to present their production of Schools Will Rock You for one week only! Based on the smash-hit We Will Rock You, with an original story inspired by the music of Queen, the production amazed audience members for over 10 years in London's West End. Previous productions at Castle Newnham have been reviewed as 'outstanding', 'marvellous' and 'visually stunning'. The Lion King in 2016 won Best Youth Production in the region and The Railway Children was seen by over 500 people and nominated for Best Youth Production in 2017. Following the success of last year's sell out production of Singin' in the Rain, Schools Will Rock You is not to be missed! Schools Will Rock You is suitable for age 8 and above. Please speak to the Box Office if you require any access arrangements on the evening of the performance. SOLD OUT performances - contact the Box Office via email only to see about ticket returns and additional availability.